Two years ago (August 28,2007, to be exact), I wrote this piece. 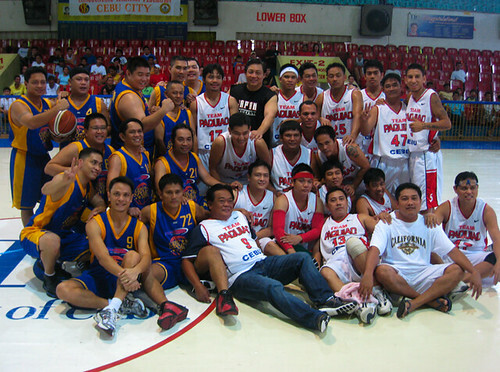 It’s relevant given that PacMan is scheduled to play basketball again in Cebu. I LIED. 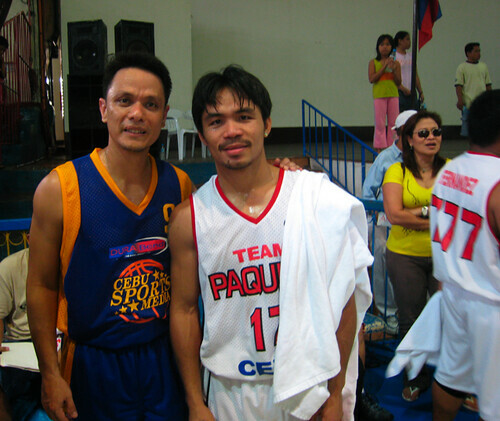 In an article I wrote two days ago, I vowed to stay five feet away from Manny Pacquiao when I’ll guard him in basketball. But when we met last Sunday morning from 10 to 12 at the Cebu Coliseum—his Team Pacquiao versus our Cebu Sports Media squad—we collided. Literally. It happened in the third quarter. Manny dribbled as point guard as I applied man-to-man defense on the world champ. I drew closer as he dribbled—the lefty that he is—with his left hand. I sprinted to his left, caught the orange ball for a split-second, as Manny and I scrambled for ball possession. I stole the ball—almost—as Manny sprinted to retrieve it. I fell to the parquet floor and, within a split-second, so did Manny. We both locked arms on the ball, our backs on the ground. The referee blew the whistle. Now, wait. Before you think it was a scary Oh-my-God-he-might-get-injured moment, it wasn’t. Manny got up. I got up. We laughed. Manny patted me in the back. The game moved on. But think about this: Isn’t basketball, with six weeks left before Las Vegas, too risky a game? Yes. Because while Manny purposely slowed his steps last weekend, in this sport with 10 pairs of elbows and 10 pairs of knees on the floor, injury can strike as quick as a Pacman left hook. So if I were Manny—though he’s promised to make this an every-Sunday game—here’s some unsolicited advice from the same person whom you fell with on the floor: If you must play, just shoot—no games. Or better, take the boys instead on a morning jog. Play bowling. Darts. Billiards. Go to Mactan. Swim. HOOPS. But back to basketball, what have I learned from Manny? One, that he’s normal. And friendly. The “world’s most famous Filipino” that he is, he isn’t snobbish. When someone asks for an autograph, he’ll oblige. His superstardom hasn’t crept inside his brain and inflated it like a balloon. Third, he’s generous. Did you know that last week, before his team played, he brought them to Ayala Center’s Athlete’s Foot shop, and bought each of them a brand-new pair of Nike Air basketball shoes? Fourth, if not for his lack of height and had he not chosen boxing, he’d be a PBA star. That’s how good he is as a sharpshooter. Plus, his foot speed you can’t catch. His competitive spirit you can’t match. Fifth, he’s a showman. He loves the crowd. He craves applause. He’s energized by the buzz and noise and frenzy of people clapping and cheering and shouting his name. Last Sunday, before Manny arrived, no spectators were allowed inside the Cebu Coliseum. 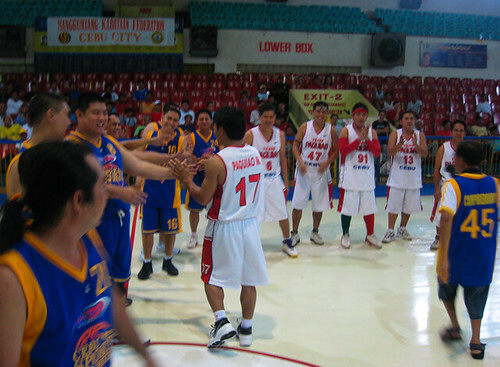 But as soon as he entered—with Manny’s instructions, I’m sure—the hundred or so who longed to see their idol entered. Manny is a showman. At one play, he dribbled past all defenders and drove straight for the goal. But he didn’t shoot. Instead, he dribbled around and around. Of course, the spectators—who included Vice-Mayor Mike Rama and Councilor Yayoy Alcoseba—burst in cheers. On another play, he drove for a fast-break lay-up but, instead of shooting, he threw the ball against the backboard then jumped as the ball bounced in between his legs and was caught by his first-cousin Warren who sank the lay-up. Plus, Manny brought along showmen Dennis Padilla and Long Mejia. His team’s top players? 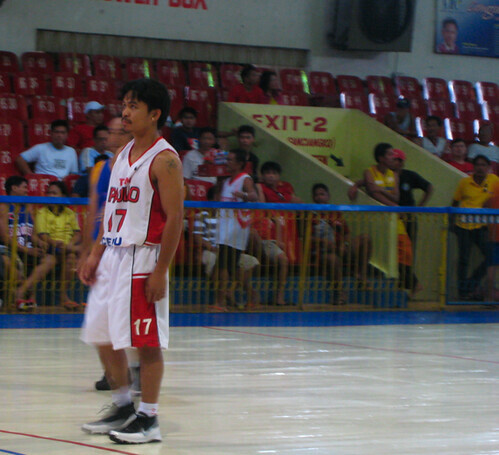 Jing-Jing Rama, who fired eight triples for 26 points, and the acrobatic, high-jumper: Bobby Pacquiao. Our team? 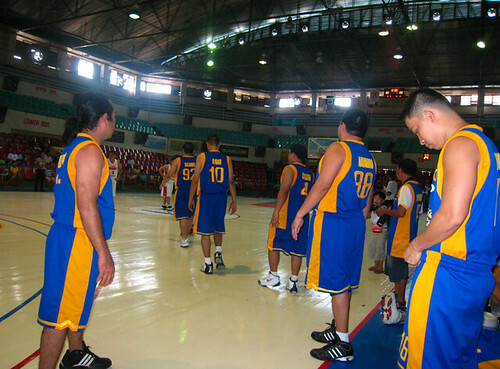 I top-scored with 29 points but it was Manny Villaruel (The Freeman’s sports editor) who provided long-range shots. Our teammates: Atty. Jingo Quijano, Roy Aznar, Jun Migallen, Allan Choachuy, Erwin Lirazan, Rico Navarro, Allan Defensor and Calvin Cordova. Fun? Memorable? Of course. When do you get the chance to come face-to-face and, in my case, topple to the ground, the world boxing champion? John, I see you can still drop 29 points….of course, I thought you were the best point guard among our batchmates. By the way, you never mentioned who won this game or did I miss it. HI Raffy! Yup, did not mention the score because it was all over the Cebu papers the day after the game. Our team lost by I think 9 points. They were too plenty (30 or more players) and too strong. Thanks! Hey John! Well I guess some promises just cant be followed heheh. Nice 29 points by the way.